AudioPal is an audio site that allows you use different ways to record your voice for your website or blog, like use phone call, type text, recorded by microphone, or direct upload your audio file. You can choose different languages and accents if you input text, for English it from US, UK, Australia and other. If you choose telephone, you have to dial a phone number and give a password. Record your voice by microphone is easy way, just plug in your microphone with your computer and speak something. After done, you can preview and make sure everything is right. Last step is fill you email address, and click "Get it" button. 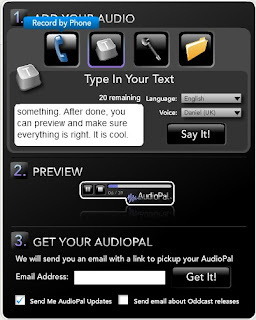 AudioPal will send you an email that with a link of your audio. You can put it on your website or blog. It is cool.